AUSTIN, Texas (June 1, 2015) – As American wine consumption continues to eclipse that in other countries, and as Millennials adopt wine faster than any other generation*, Whole Foods Market launches Criterion Collection wines to satisfy consumers’ thirst for wine knowledge. The series offers textbook examples of sought-after wine styles from around the globe, providing novices and pros alike a trusted reference point to develop palate and preference. Throughout 2015, the retailer will introduce a total of eight wines, all priced affordably and selected by Whole Foods Market’s experts, including a Master Sommelier. Taking the guesswork out of a sometimes dizzying selection, these benchmark wines provide inexperienced wine shoppers with a point of reference for each style. Seasoned wine drinkers, particularly the growing number of people studying for wine certification exams and conducting blind tastings, can use this collection to train the nose and palate to identify these varieties. In April, Whole Foods Market launched the first Criterion Collection wines with an Italian Pinot Grigio and an Argentinian Malbec, and will introduce a Spanish Rioja, Italian Chianti, Coonawarra (Australian) Cabernet Sauvignon and Chilean Carmenere in June, with additional releases coming in late June and September. Friuli Pinot Grigio DOC – Tempered by the Adriatic Sea, protected by the foothills of the Alps, and nurtured in the gravelly soil that gives the Friuli Grave its name, this Criterion exhibits the remarkably fresh character that defines Pinot Grigio. Chianti Classico – Chianti is as old as winemaking itself, and Criterion’s Chianti Classico comes from the very roots of its Tuscan birthplace. Reflecting the legendary terrain that surrounds it, this Criterion finesses big ripe flavors and subtle floral bouquets to create a wine of profound beauty. From Spain’s most renowned wine region we selected its prized Tempranillo grape, then treated it with patience. After 20 months aging in oak, and two years in the bottle, this Criterion rewarded us with a dark fruit body, velvety mouth, and long, elegant aftertaste. 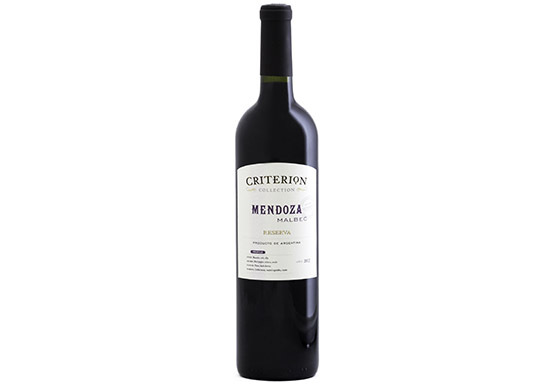 On the Andean benchlands of Mendoza’s Uco Valley, we found the Criterion for Argentinean Malbec, where high elevation and a long growing season concentrate generous flavors of berry, delicate aromas of warm spice, and a stunning deep purple hue. The southernmost region of Chile’s Colchagua Valley is famed for its rugged cowboys and full-bodied reds. Our Criterion Carménère captures this Andean spirit with a generous balance of black and red berries, hints of cinnamon, nutmeg and a savory touch of dark chocolate. A marriage of rich terra rossa soil, pure underground water and a long, cool ripening season made Australia’s tiny Coonawarra region the birthplace of world-class Cabernet Sauvignon. Complex in character with an inky hue, this Criterion explores flavors of currant, eucalyptus and black plum.